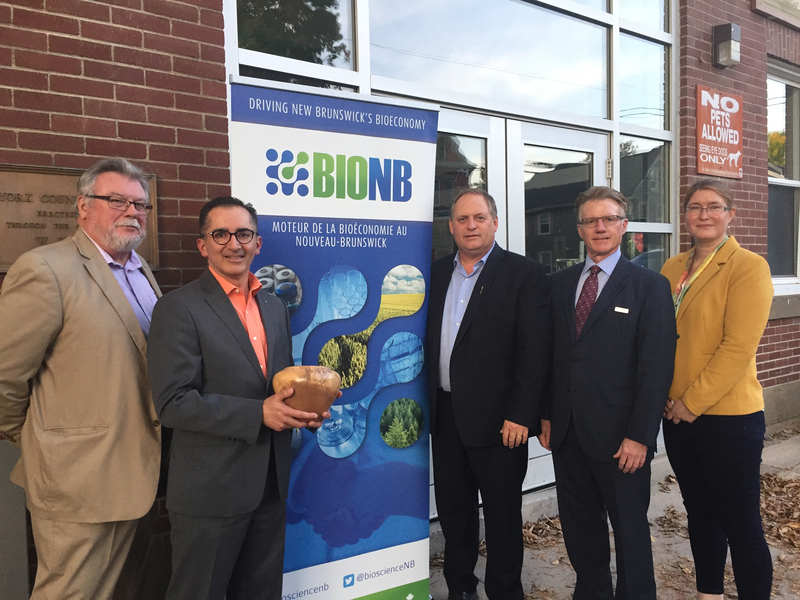 BioNB, New Brunswick’s bioscience agency, awarded ADI Systems the New Brunswick Bioscience Achievement Award on Thursday September 21 at the annual industry event, Innovation at the Market. Over 150 members of the business and research community gathered for the presentation of the award and the celebration of the substantial growth experienced by the province’s bioscience sector in recent years. ADI Systems provides wastewater treatment and waste-to-energy technologies for industrial processors around the world. This includes many household names such as The Kraft Heinz Company and The Kellogg Company. ADI Systems has also completed successful wastewater treatment projects locally—including a system at Old Dutch Snack Foods in Hartland—and the company is currently working on a large-scale project at Lake Utopia Paper, a J.D. Irving Company. ADI Systems was founded in New Brunswick nearly 30 years ago and has successfully expanded over the years to build a global presence. In the process, they have created many employment opportunities for New Brunswick residents, helping grow the local economy. The New Brunswick Bioscience Achievement Award is given out every year and recognizes one individual, company or research team who, above all others, has made outstanding contributions to the growth and promotion of the sector and has helped to put New Brunswick on a national or global map. Among the long list of previous winners are Sylvar Technologies, LaForge Bioenvironmental and LuminUltra Technologies. This year’s award was presented at Innovation at the Market, the bioscience community’s flagship networking event and celebration of Global Biotechnology Week (September 20- 27). ADI Systems was chosen from among four strong nominees this year: Dr. Chris Baker of IPSNP Computing; SomaDetect, a start-up and finalist in NBIF’s Breakthru Competition, and Dr. Murray McLaughlin of Bioindustrial Innovation Canada. McInnes Cooper, a leading Atlantic Canadian and national law firm, sponsored the Bioscience Achievement Award, which was presented to ADI Systems by Jaime Connolly, partner in the Fredericton office. BioNB hosted Innovation at the Market with the support of the following sponsors: LuminUltra Technologies, Grant Thornton, McInnes Cooper, CIBC Wood Gundy – Mais Reynolds Financial Group, the Research and Productivity Council, LearnSphere and the New Brunswick Innovation Foundation. In addition to the awards celebration, Innovation at the Market featured a promotion by Buy/Achetez NB, part of the New Brunswick Department of Agriculture, Aquaculture and Fisheries. ADI Systems, an Evoqua brand, is a world leader in industrial wastewater treatment and waste-to-energy solutions. The company’s proven anaerobic and aerobic technologies reliably treat wastewater to help industrial processors comply with environmental regulations and reduce/eliminate surcharges. ADI Systems also offers technology to capture, treat, and utilize biogas as a source of renewable energy. With over 35 years of experience, ADI Systems’ experts customize the most efficient treatment process for each plant’s needs, providing a turnkey, design/build solution for customers worldwide.